After a light dinner and a few glasses of red, Madge was raring to go. 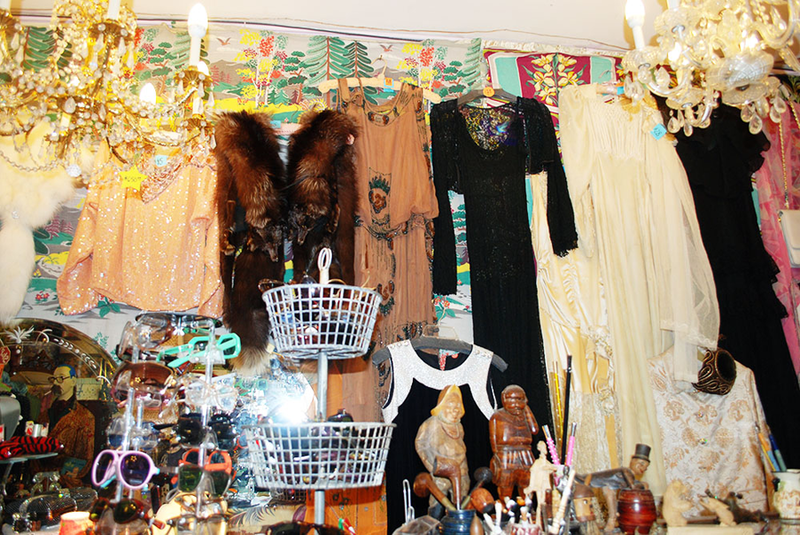 Yesterday had been a mad dash through the Cats Pajamas Vintage show in Elgin, see part 1, and this morning, gal pal Mary was taking Madge on a tour of her favorite vintage haunt – The Antique and Resale Shoppe, a modest name for an amazing shop situated in the northwest corner of Chicago. Madge had to admit she was unimpressed as we drove up to the nondescript strip center. But once the door opened, Holy Cow! The shop bills itself as the 8th wonder of the world, with a sign claiming 15,000 square feet of vintage. But that’s a typo because it’s actually measured in cubic feet, stuffed floor to ceiling with shelves, display cases and racks, it’s 360 degrees vintage. 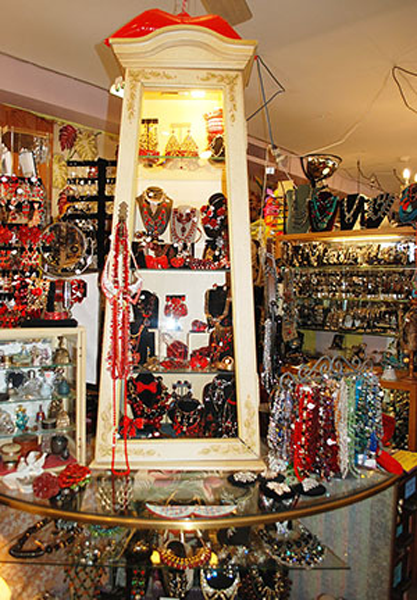 As you first walk in there is a lovely selection of vintage linens, then once around the corner you see literally thousands of pieces of jewelry, some not particularly old, but plenty of true vintage pieces as well. Winding her way through the display cases, Madge was amazed that every little piece was marked with a stock number and a price. What at first looked haphazard was in fact meticulously curated. Farther in, loads of home goods including barware, dishes and even a fascinating selection of historic photos. But we were on the prowl for fashion and that ARS has in mass quantities, including dresses, belts and shoes. From the 20s to the 80s, You name it they’ve got it. 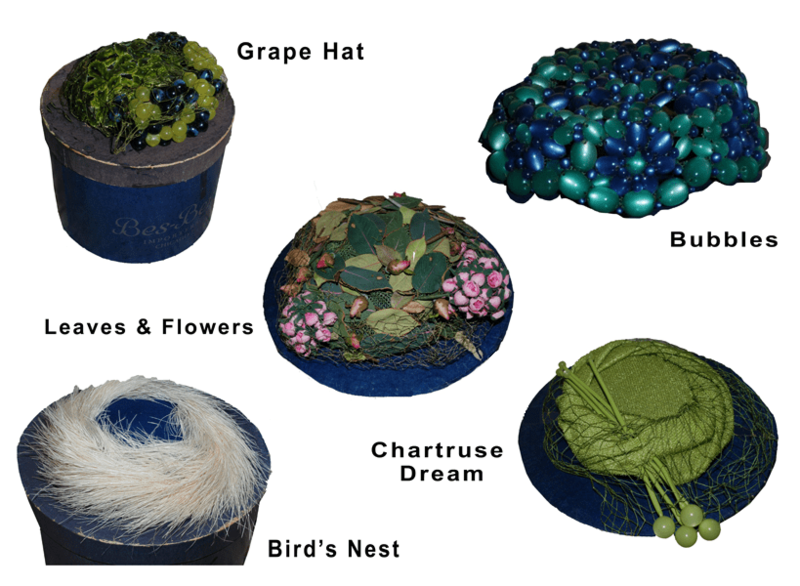 Finally, in the back of the shop, the Holy Grail – hats. Lots and lots of hats. Mary who is writing not one, but two books on Chicago milliners is always on the look out for obscure local labels and this shop doesn’t disappoint. Of course Madge snagged one right from under Mary’s nose and bought it before she saw it. Hey, it’s a jungle out here. Co-owner Susanne and the gang really get into showing of their wares. There are no minimalists here. 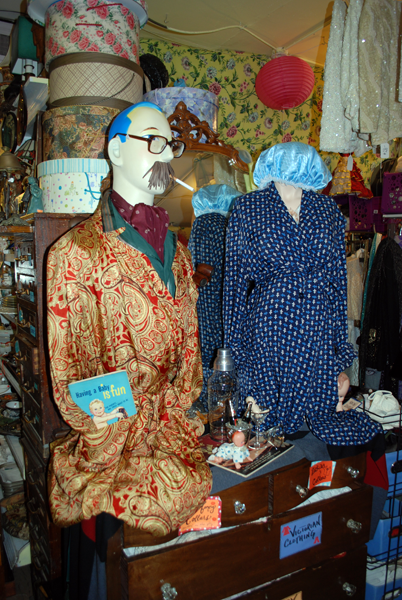 Everyone is decked out head to toe in fabulous vintage. Suzanne and friend posing with all of those hats. Even the VP of customer relations, a lovely French poodle, gets in on the act. And the best part of all? Their prices. Their motto must be, why buy one item when you can afford to buy twelve! Check out this fun video with both Susanne, and co-owner Jules showing off the place to a local news anchor. A comment from one of their regulars sums up this shop. 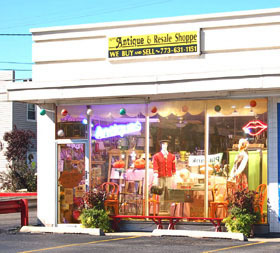 She comes to Antique and Resale for “their special kind of retail therapy”. After the shopping extravaganza it was time to do my other favorite thing in Chicago – eat. Mary took me to one of her favorite lunch spots, Portillo’s, a local chain famous for their Chicago dogs where yet another mindboggling array was on display, only this time it was food instead of vintage. Back on the road, Madge gasped at an amazing site and implored Mary to stop. There it was, the Leaning Tower of YMCA. Oh yes. 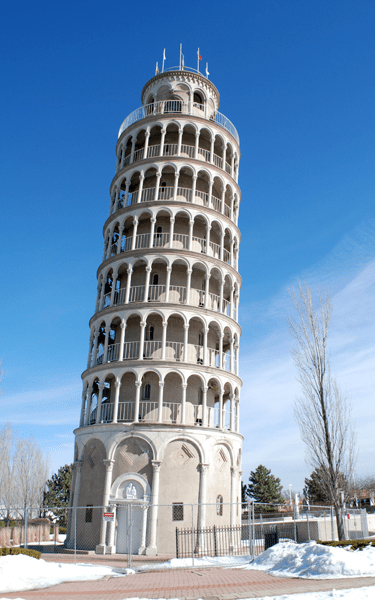 A half-size replica of the famous Pisa Tower built in 1934 by industrialist Robert Ilg as part of a recreation park for employees of his company, Ilg Hot Air Electric Ventilating Company of Chicago. Is that a fabulous company name or what? Originally serving as a water tower for the park’s pools, the tower became marooned when Ilg family members donated most of the land to the YMCA. Sadly this wonderful monument to kitsch has seen better days. Let’s hope the city of Niles can get their act together and restore this tower to its former glory. The shop closed in the 1960s and Benjamin Greenfield later became a philanthropist, endowing an exhibition wing at the Chicago History Museum. His trademark was a silk violet flower, often with a rhinestone, sewn into the interior of each hat, a loving tribute to his mother. Hudd dressed most of the fashionable ladies of Chicago in the 1950s and 60s and was still designing well into the 1980s when only the most ardent fans were still wearing hats. Phyllis Diller was one of his major customers and had over 500 Hudds. Mary was lucky to get to know this unique designer before his death at age 86 in 2011. She was even tasked with finding homes for many of his pieces when the Chicago History Museum decided to deaccession part of their collection of Raymond Hudd. 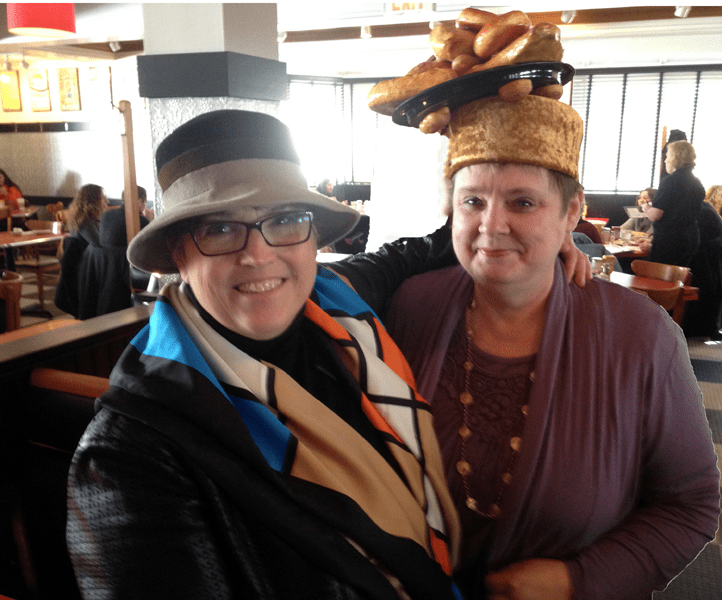 Of course Mary and her Hudd posse made sure each amazing hat found a new home, including Madge’s! After a weekend of total hat nirvana and figuring out how on earth to get her Hudd space age creation home, Madge sadly bid adieu to her Chicago mad hatter friends and also to one of her favorite cities. But first – breakfast! 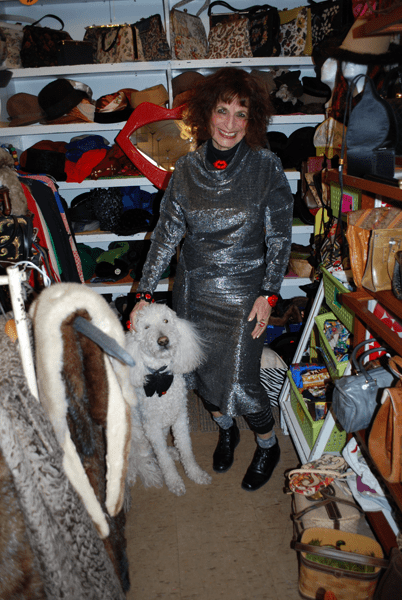 Great review on Chicago vintage …..have been to that shop myself on a visit and went a way with a few things….very well priced. What a treat to see Mary’s hats from Bes-Bens and Raymond Hudd. Waiting to see where Madge goes next ….keep up the great reporting .